The second annual San Diego Beer and Music Festival will take over Liberty Station's NTC Park in Point Loma on Saturday, July 30, from 7-10pm (6pm for VIP), for an evening of craft beer and live music to raise funds for local charity Promise2Kids. 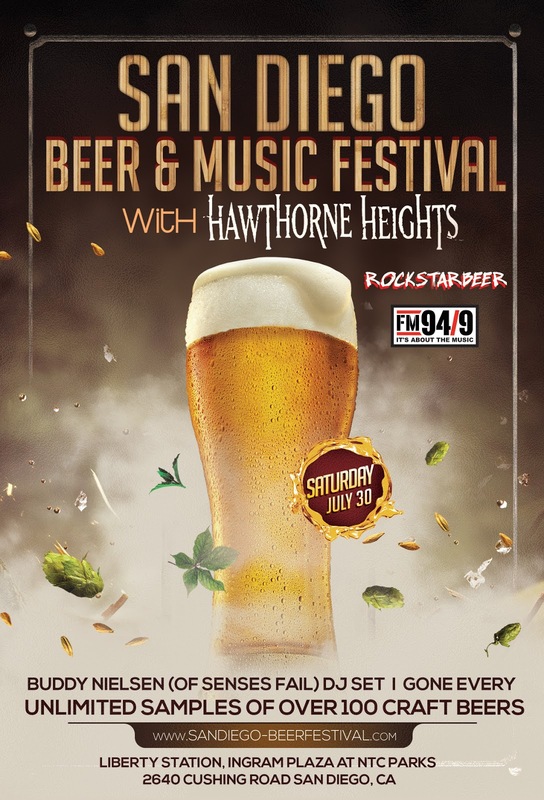 Presented by #RockStarBeer Productions, FM 94/9, and many area breweries, the festival will showcase over 100 craft beers from more than 50 local and regional breweries as well as local bands and DJ's, a food truck pavilion, and a live performance by headliner Hawthorne Heights. We are raffling off a pair of VIP passes to attend ($100 value) as well as offering promo code SDVILLE for $5 off any ticket. Keep reading and be sure to enter for a chance to win! During the second San Diego Beer and Music Festival, enjoy live music as NTC Park at Liberty Station is filled with craft breweries pouring unlimited tastes of their finest beers. Participating breweries include Ballast Point, Angel City, Deschutes, Saint Archer, Knee Deep, Duck Foot, 10 Barrel, Figueroa Mountain, Ninkasi, 32 North, Lagunitas, Helm's and many more. Tickets to the San Diego Beer and Music Fest are $35 in advance for GA tickets ($40 at the door) and $50 in advance for VIP passes ($60 at the door). Save $5 per ticket with promo code SDVILLE at checkout. VIP tickets include an hour early admission (4pm) and access to the VIP area with unlimited samples of some rare and limited release beers. This is a 21-and-over event and tickets can be purchased online. For more information on the San Diego Beer & Music Festival, visit sandiego-beerfestival.com.